While on my vintage embroidery search, I came upon another super vintage site, but this one is vintage needlework of all types. From sewing, crochet, knitting, embroidery to old stamped linens, quilt panels, and even completed needlework, this website is quite a treasure. You’ll want to kick back, put your cyber feet up, and take a leisurely browse through this fascinating site. Update, 2012: The Vintagecat website is no longer available. The owner, Charlotte, passed away after a battle with cancer, and the site was subsequently closed. It was a beautiful site, and Charlotte did a wonderful job with it. At Vintagecat Sewing Patterns, Needlework, and Fashion Pages, you’re not going to find “free” patterns, but don’t let this deter you from having a good look at the site. 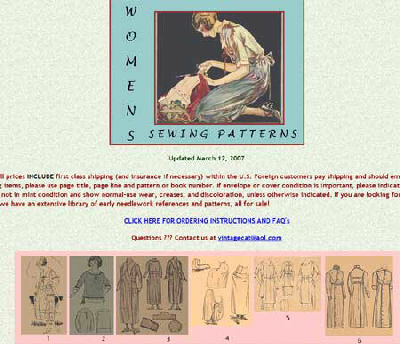 What you will find is lengthy pages full of vintage sewing and needlework patterns and even stamped items for sale, with excellent descriptions of the pattern or item. On their vintage sewing pattern page, for example, you’ll find pattern that date from the 1890’s through the 1950’s and a little later. You’re able to view a row of pattern photos, followed by a lettered title and description corresponding to the individual patterns. Just as with any used goods or antique dealer, the condition of most items are clearly indicated. There are further vintage clothing patterns that any costumer would likely love to browse through! But here’s the find for embroiderers who like vintage stuff! The Embroidery Transfer Patterns, Stamped Linen, and Books Pages. 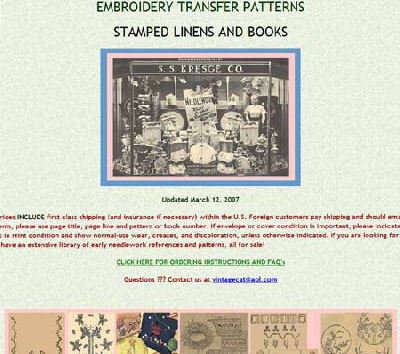 This page is full of embroidery patterns, transfers, and even pre-stamped linens – all vintage, with conditions clearly marked. The descriptions are detailed and lengthy. One more page that I really like is the Crochet, Knitting, and Needlework Patterns page – not just because of the patterns (she’s got lots of the Priscilla books, lots of edgings books, etc. 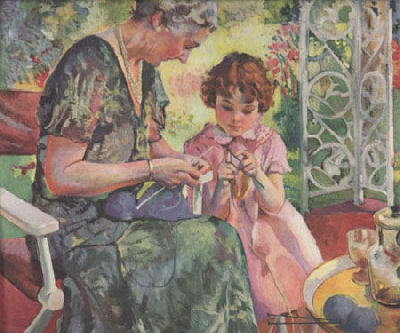 ), but because it’s headed with this darling picture, which sums up one of the greatest aspects of most needleworker’s lives. So check out the extensive Vintagecat pages! Their ordering process looks pretty simple: you email them what you want off the site, they double-check inventory, then they send you an invoice. You can either pay online or send a check. If anyone’s enjoyed ordering from Vintagecat, feel free to let the rest of us know about their service! While reading this post I went to the Vintagecat site, unfortunately it is no in business: the owner passed away due to an extended bout with cancer. All three suggested sites above were NOT FOUND or not avaiable! Yes, the article was written in 2007. Charlotte has since passed away, and the site has been closed. I removed the links. Thanks! Previous Previous post: Piper’s Silk – A Gift from Alaska!